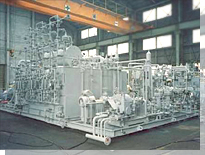 MISUZU INDUSTRY has delivered about 3000 oiling systems which supply lubricant, shaft seal oil, and control oil for large machines used in petrochemical, power generation and cement plants and iron-making and paper-making plants, such as compressors, turbines, pumps, mills and kilns. 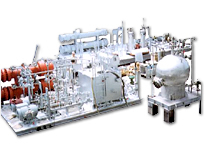 This system is installed near a lager gas turbine. 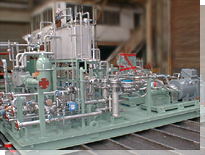 It includes modules for lubricant, control oil and fuel oil as well as water washing and starter modules. 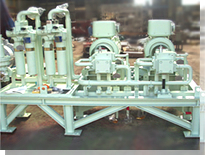 This system supplies oil to lubricate the bearings of large fans and pumps or control movable vanes which are used in a nuclear power plant.The system is subjected to rigorous inspection before shipment. 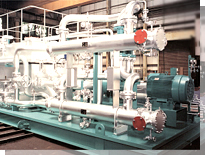 This system supplies clean control oil to a steam turbine in a large power generation plant. 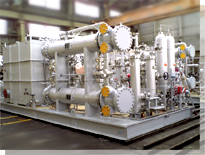 It is specially designed for quiet operation. 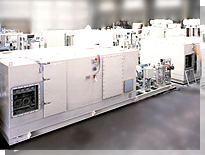 This system supplies lubricating oil to a gas turbine. 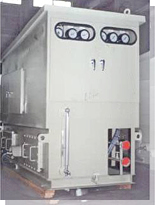 It incorporates means against noise and vibration.